At MSIG, we go above and beyond to deliver the best that we can. Our claim philosophy is to provide claim settlement services that are effective and efficient. Our team of experienced and customer-oriented staff is committed to rendering the best assistance in cases of unexpected loss / damage. 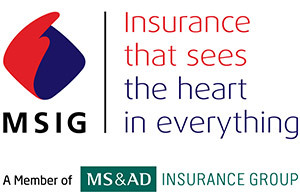 This guide is designed for your convenience in filing a claim with MSIG. Notify us / your agent / broker of a loss and / or damage that may give rise to a claim. Claim notice can be made to MSIG via phone first, then in writing later. Immediately inform the Police or relevant state authority of loss / death or serious injury / damage by theft or burglary or by any liable third party. Take necessary steps and exercise due diligence to minimise the extent of loss or damage. Preserve the damaged items for survey and evidence collection. Do not discard, remove or commence any repair works related to the destroyed / damaged items without prior consent of MSIG. Take photographs or collect any possible evidence to prove the damage and retain for inspection. Assist and cooperate with our appointed surveyors / adjusters / representatives in the course of their survey / investigation. Do not admit liability or offer payment to any third party. Collect information of third party and preserve our subrogation rights to recovery, if any. Claim Note (as per standard form) with a breakdown of the items of claim. Documents / evidence supporting the claim items as per the breakdown in the Claim Note. Invoices of the lost / damaged items, where applicable. Accident Report with photos (if any) showing the damaged property or scene at which the insured property was damaged or lost. Police Statement / Fire Brigade Report, where applicable. Form of Acceptance for claim compensation (if necessary). Any other additional documents which we may require.